Goats are the ultimate eco-friendly weed whackers. This article in the L.A. Times today (Thanks Caleb!) reminds me of one of the key systems that small farms use and “big Ag” (industrial farming) has gotten away from. Rotating crops and animals in complementary ways. This is part of what the Slow Food conference was about. Going fast, or “progress” brought us weed whackers and lawn mowers and such. Noise-polluting, fuel-consuming, waste-producing stuff = bad. Goats bring us back to “slow” ways. 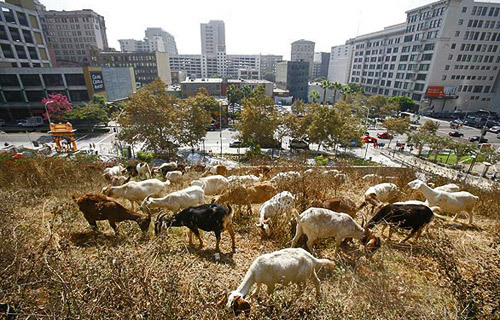 Goats don’t use fossil fuel (except in the transport of them to this lot). They don’t pollute, but do fertilize; and they bring people together, too. The article notes commuters stopping to chat and snap photos. Normally, they’d be rushing by, avoiding the noise and dust and each other. Weed-eating, fertilizer-producing, community-building = good. Pig farmers, I’ve learned, use goats to eat the weeds around the pigs’ paddocks. Chickens follow behind and scratch around in the poo, fertilizing the soil. Pigs eat a fresh patch of clover and grass and then the whole cycle gets repeated in a fresh patch. Makes sense for everyone: the pigs, the goats, the chickens, the farm, the water supply. Compare it to what happens at factory pig locations such as Smithfield. Horrors of waste, pollution and well documented abuse of both the pigs being raised and the workers. See the original exposé in Rolling Stone here, Boss Hog. The more you know about it, the more “going slow” makes sense. Slow Spirits, here on FoodBuzz. Some great shots of the event, the gobs of people, some good food. 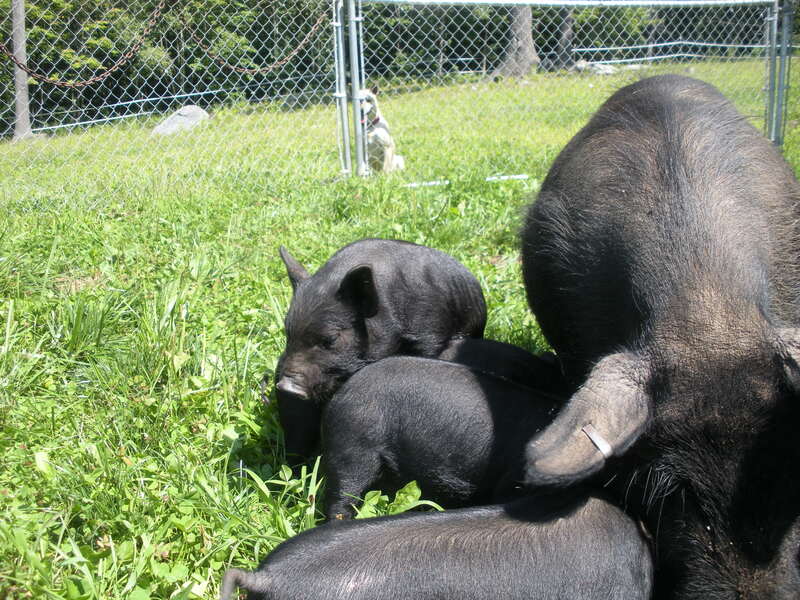 Shirley’s pigs in clover at SullBar Farm.